Photo Caption Above: Berkeley College students, faculty and staff collected 185 items to help the New York Jets tackle hunger with Food Bank For New York City this holiday season, along with a donation of $15,000 to the hunger-relief organization. Following the check presentation on November 20, 2018, Berkeley College students and officials helped current Jets players Kelvin Beachum (Number 68) and Tom Hennessy (Number 42) and Jets Legend Erik Coleman, prepare and serve a pre-Thanksgiving dinner for more than 400 guests at Food Bank For New York City’s Community Kitchen in Harlem, NY. The donation will provide 75,000 meals for New Yorkers in need. Left to right: Berkeley College faculty, staff and student representatives, and Jets players: Janelle Giles, Director, Berkeley College Student Development and Campus Life; Joseph Charleman, Chair, Surgical Technology and Surgical Processing Technician programs; Berkeley College School of Health Studies; Jets Legend Erik Coleman; Jets players Kelvin Beachum (Number 68); Francisco Tezen, Chief Development Officer, Food Bank For New York City; Jets player Tom Hennessy (Number 42) and Berkeley College student Javon Parker, tackle hunger at Food Bank For New York City. Community service efforts such as this exemplify Berkeley Cares, a Berkeley College initiative that seeks to empower the Berkeley College community to positively impact society. 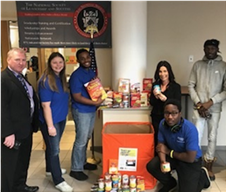 Photo Caption Below: Top: Berkeley College officials and students on campus ready the donations for transfer to the Food Bank For New York City. Middle: Berkeley College officials help prepare meals on the tray line. Below: Jets Players Kelvin Beachum (Number 68, Tom Hennessy (Number 42) and Jets Legend Erik Coleman, at the ready with their aprons on, pose with Berkeley College Knights mascot, during their volunteer efforts at the Community Kitchen in Harlem, NY, Food Bank For New York City, in serving pre-Thanksgiving dinner to more than 400 New Yorkers in need.